Tranformer Prime rival arrives but can it compete? French tech manufacturer Archos have been banging out tablets since before you were in long trousers, Sonny Jim - although back in the early noughties, the likes of its AV series were simply considered big screen portable media players. So the company has plenty of experience to draw on and, with its latest tablet range - the Gen 10 XS series - it has done just that, mixing a few different form factors to bring us three new hybrid Android devices. The flagship device, the Archos 101 XS, sits alongside the Archos 97 XS and the Archos 80 XS, which are both listed as coming soon. 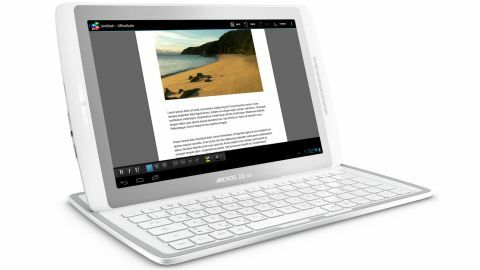 The 10.1-inch, keyboard-boasting Archos 101 XS is due to launch in the middle of September with an RRP of £299.99/$360. It's a price tag that makes it a bit cheaper than its direct hybrid rival, the Asus Transformer Pad 300, much cheaper than the hybrid king - the Asus Transformer Pad Infinity - and also easier on your bank balance than mid-range Android rivals such as the Acer Iconia Tab A510 and the Toshiba AT300. Unlike those tablets, however, this is not a quad-core Tegra 3-touting machine. Instead, it's powered by a multi-core Texas Instruments OMAP4470 processor. This multi-core setup equates to a dual-core Cortex-A9 CPU clocked at 1.5GHz, along with two much slower Cortex-M3 cores. Throw in a PowerVR SGX544 GPU and you've an engine room more on a par with the mid-range Samsung Galaxy Tab 2 10.1 than the Android heavy-hitters. Running Android 4.0 Ice Cream Sandwich, Archos is promising a Jelly Bean-flavoured update soon. So for Android fans looking for a cheaper ticket to the party, along with some physical QWERTY fun on the way, Archos hopes it is offering up a viable option. Has it succeeded. Physical keyboard-packing tablets are becoming increasingly more popular and, with Windows 8 on the very near horizon, we expect to see many more Android devices packing a QWERTY punch. The Archos 101 XS, like the Asus Eee Pad Slider, Asus Eee Pad Transformer and others that have gone before it, is a tablet that attempts to solve the puzzle of how to make a tablet more user friendly. Like those Asus efforts, Archos has proposed that the answer lies in the use of a physical keyboard that attaches itself to the slate. You can, of course, team up any Android (or iOS) device with a keyboard using Bluetooth connectivity, but Archos has chosen the docking keyboard option for the 101 XS. Its physical keyboard comes combined as part of what it calls the "coverboard", and is basically a lid that sits flush with the tablet's screen, using magnets, creating a netbook-like effect. A very skinny netbook that is, since the tablet part of the Archos 101 XS is just 8mm thick, with the coverboard only adding a further 5mm. When you consider that its direct rival, the Asus Transformer Pad 300, measures a combined 20.1mm, its 13mm waistline is all the more appealing. At almost 400g (0.88lbs) lighter than the budget Asus machine as well, it's definitely a much more portable friendly setup. On its own, the Archos 101 XS tablet weighs 630g (1.39lbs), and the coverboard only adds a further 270g (0.60lbs) to the mix. But unlike Asus's hybrid tabs, which offer clever keyboard docks that expand connectivity and enhance battery life, the coverboard is pretty poor in comparison. Its only port is a micro USB one, which is used for charging the tablet when docked. When not connected to the mains, the Archos 101 XS's keyboard drains power from the tablet's battery. And the build quality, not just of the dock, but of the whole device, is nowhere near on par with its competitors. Starting with the dock, its thinness works against it, feeling very weak, with plenty of flex and incredibly plasticy. The keyboard keys have an incredibly shallow travel, so typing for long periods of time isn't too comfortable. And the kick-stand, which pops up to hold the tablet in place for typing sessions, is incredibly feeble. In its most upright position it will hold the tablet in place - just - but try to adjust the angle (although we're not entirely sure you're supposed to) and you'll run into trouble, with it giving way under the weight of the slate. The method used to hold the coverboard and the tablet together, using magnets, is also pretty basic. Sure, the twist motion that Asus suggests to separate the two pulls them apart easily enough but, on more than one occasion, we pulled the Archos 101 XS out of our bags only to find the tablet wasn't sitting flush with its partner. The tab itself also suffers from appearing 'cheap'. The white plastic edges don't exactly blend into the mock (plastic, of course) brushed metal finish, and the lip between the silver trim and the 10.1-inch display is pretty sharp. It's a build that is also massively susceptible to scuffs and scratches - ours was a bit of a mess after only a short while of regular use and transportation. The volume rocker and the power button, positioned on the bottom-right corner, are incredibly thin and fiddly to use, and the speaker grill up front is pretty incongruous. On the left-hand side is your port activity. You'll find a mini HDMI port, a 3.5mm headphone jack, a micro USB port and a microSD slot awkwardly positioned here. The bottom edge contains the dock connector and a couple of magnets. The display is a TFT (MVA) one with a respectable 1280 x 800 resolution. Although, while the pixel count is on a par with its similarly priced rivals, the quality falls a little short. Even on full brightness the display is pretty lifeless, and the glossy finish makes it incredibly susceptible to fingerprints and smudges. There's no auto-brightness function, which is a little odd for an Android tablet, but you'll most likely want the lights on full anyway. Onboard storage is 16GB, and you can expand this by up to 128GB using the microSD option. Copying and pasting from microSD card to internal storage, and vice versa, is a piece of pie, thanks to the nice File Manager app that Archos has pre-installed. Data connectivity is Wi-Fi only; there is no 3G version of the Archos 101 XS.